In ancient times, a kitchen hardly consisted of anything more than a stove which traditionally was termed ‘Chullah’. But nowadays everything has been consumed by trend and style. In a world where everything is on top of the class why would kitchens be left behind? Modular kitchen is a customized approach of refurbishing or constructing your kitchen to suit not only to the current trend and fashion, but also to avail maximum utility of your entire kitchen. If you are bored of the traditional, age-old kitchen then it is the time to restore it to its former glory with a touch of modernization turning it into a classy modular kitchen. 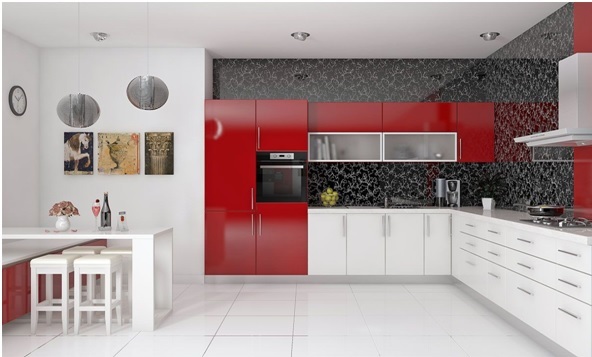 To fulfill this desire you might want to understand the concept which defines popular modular kitchen designs. CABINETS: Modular Kitchen designs focus more on kitchen cabinets improving the storage parameter of the kitchen. Kitchen cabinets mostly are subdivided into upper and lower sections. Upper cabinets are mostly made of glass doors, one door or two door opening cabinets. Glass etched or paints normally upscale the Fashionista of the design. Lower cabinets are generally built with Trollies and pull out wire handle cabinets for providing storage and other basic functions. KITCHEN FURNITURE: Modular kitchen furniture includes added incentives incorporated alongside cabinets to provide ease and comfort. Sinks installed on the top of the lower cabinets for cleaning and other purposes, shelves for sheltering various appliances like toasters and microwaves and other such added piece of wood aimed mainly for a specific purpose are termed kitchen furniture. KITCHEN UNITS: Certain cabinet units are built for a special purpose to elevate the look and utility of the kitchen. Bar units used to hold bottles of beverages and to sort a collection of glasses tend to enrich the feel of a modular kitchen. Other such units can be developed as book shelves to display recipes or to showcase the jars of spices and other such food essentials. STORAGE: One of the most important aspects to be considered while redecorating your kitchen is the storage space one seeks. The cabinets do provide the much needed storage, but extra storage units or cabinets can also be made. However, a strict check must be kept so as to avoid exploitation of the available kitchen space, hence avoiding it to look packed and clumsy. Look must not be compromised at the hands of storage and vice versa. DESIGNS: Modular kitchen designs range from trendy to concise. The simplest of all is parallel design where in the lower cabinets are adjusted along the parallel sides while the stove and sink occupy the middle area of the design. Also the upper cabinets are stacked parallel to each other. G style, L style and U style kitchens are also a popular breed, providing ample storage with elegance. Modular kitchens are not only stylish but also efficient. They blend elegance and utility enhancing the standard of living of the person. Designed with precision and creativity they are the future where we are headed.